The M93 is economy priced but has excellent performance when used in moderately priced record changers. It has an extra durable stylus assembly for heavy use. Clip-on easy-mount design cuts cartridge mounting time in half. First mount the specially designed retaining clip in the tone arm head - there's plenty of room for your fingers and a screwdriver. Then connect the leads and simply snap the cartridge into the retaining clip. The M93E is compatible with all four-channel matrix systems. 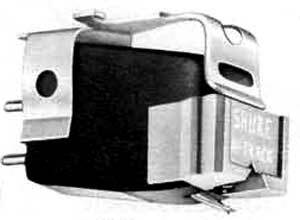 Shure M93 / M-93 owners manual, service manuals and schematics are for reference only and the Vinyl Engine bears no responsibility for errors or other inaccuracies. The PDF files are provided under strict licence. Reproduction without prior permission or for financial gain is strictly prohibited. This website is not affiliated with or sponsored by Shure.